^ a b c d e f g h Philip Stein, Siqueiros (New York: International Publishers, 1994), 14-16. 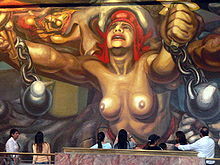 ^ a b David Alfaro Siqueiros (translation by Sylvia Calles), Art and Revolution (London: Lawrence and Wishart, 1975), 21. ^ Ruth Green Harris, “Art That Is Now Being Shown In the Galleries,” The New York Times, 7 Dec. 1930. ^ a b Edward Lucie-Smith, Latin American Art of the 20th Century, 2nd ed (New York: Thames and Hudson, 2004), 63. ^ a b c d e Leonard Folgarait, So Far From Heaven: David Alfaro Siqueiros' The March of Humanity and Mexican Revolutionary Politics (New York: Cambridge University Press, 1987), 36. ^ “Siqueiros” (advertisement), The New York Times, 9 Aug. 1961.